– It could have gone horribly wrong, but I believe I have a guardian angel watching over me, says Berthold who paddled across a humpback whale. Last week, Berthold Hinrichs from Bodø got a rare nature experience when he was kayaking in Gryllefjord on the Island of Senja. 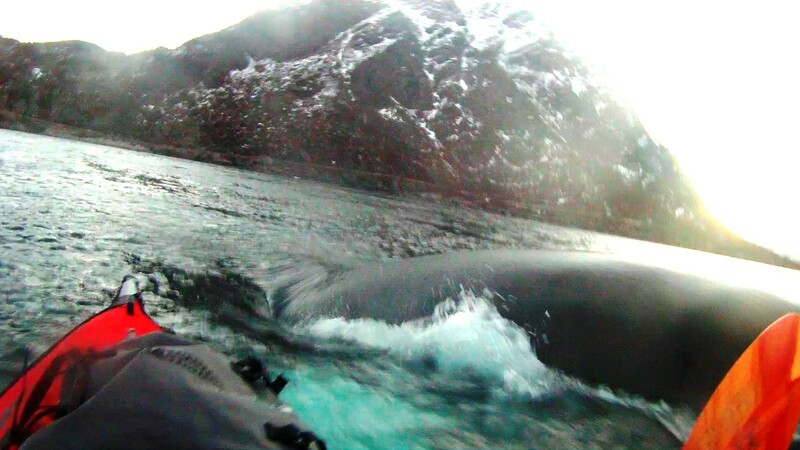 During a kayak trip, a 20 ton humpback whale came up for air just under Berthold’s kayak. – I did not really understand what happened before I sat on top of his back. Then the kayak slid off the smooth body. Hinrichs paddled for his life to reach safety. – I did not have the time to be afraid, but I felt tingling in my stomach. In retrospect, it could have turned out really bad, the adventurous paddler tells NRK.no. Fortunately, Hinrichs escaped the encounter with the giant without a scratch and did not have to perform an Eskimo roll. – My kayak is a broad and steady, so I managed to keep it on the water. But I must have a guardian angel that looks after me. I also have great confidence in these animals. When the whale saw the kayak, it seemed like it was trying to turn away, Berthold Hinrichs tells. It was all over in a few seconds before the whale went down into the depths. Hinrichs does not deny that he was paddling in Gryllefjord just to take a closer look at the giants. The humpback whale – which is appearing in large numbers of the coast of northern Norway hunting for herring – is known for its spectacular jumps, distinctive “wings” and its complex whale song. – They are very curious, playful and trusting. I searched close contact, I’ll admit that, he says. 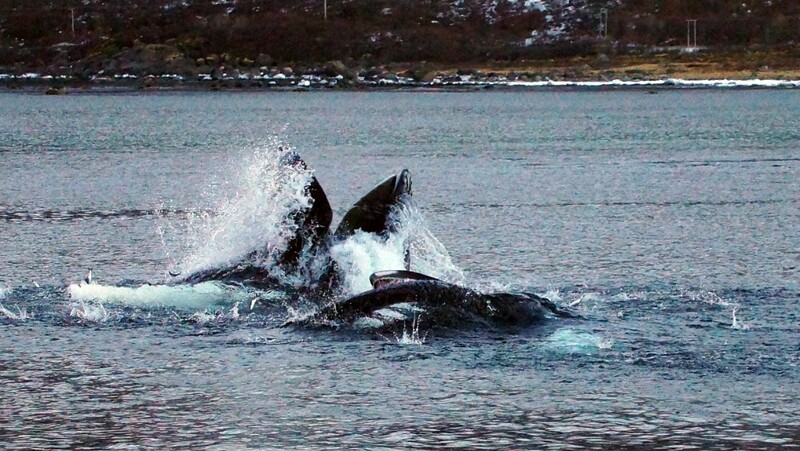 Since the beginning of November, large numbers of whales – humpbacks, killer whales and fin whales – have stayed in the fjords of Troms County. 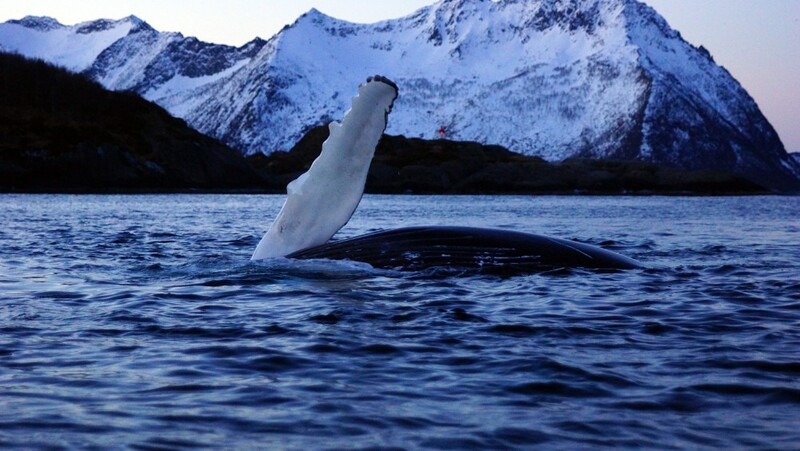 Since the 1980s, the Norwegian Institute of Marine Research has observed humpback whales in the Norwegian Sea and the Barents Sea. There are between 1,300 and 1,500 individuals in this area. The humpback whale can be up to 16 meters long and weigh up to 35 tons. The name origins from the whale’s small dorsal fin placed on a hump. The upper side is dark with long gnarled pectoral fins. It often lifts its tail when diving. The humpback whale is known for its distinctive mating song. It sings with the larynx, and on a good day, the song can be heard 30 kilometres away. Like other large whales, the humpback was and is a target for the whaling industry. Once hunted to the brink of extinction, its population fell by an estimated 90 % before a moratorium was introduced in 1966. While stocks have since partially recovered, entanglement in fishing gear, collisions with ships, and noise pollution continue to impact the 80,000 humpbacks worldwide. This video by Hinrichs shows humpbacks feeding in Hinlopenstreet on Spitsbergen, Svalbard, and some pilot whales in Vestfjorden, Northern Norway.